If you ever have the opportunity to be the person to contact someone who has won something I highly recommend you do it. It was downright fun to call our Great Kitchen Giveaway winner and tell her she had one the choice of a number of options to upgrade her kitchen with Village Home Stores. We ran the promotion during the QCBR 2014 Home Show and the month surrounding it. There were many many entries and Kathy from Milan, IL was the winner! When we finally got a hold of Kathy to tell her she won she was already in a fantastic mood because she had just welcomed a new grandbaby into the world. Inviting her to choose from a Maytag suite of kitchen appliances, free granite countertops, $2,000 in free cabinets, free kitchen flooring, or $1,000 in free lighting put her over the moon with excitement. Kathy took some time to decide what to do with this unexpected upgrade opportunity and ended up selecting granite countertops. Her existing kitchen tops were still the original Formica butcherblock pattern laminate in a “No-Drip” edge profile. Considering the age of the tops they were really in excellent condition. Kathy had just recently painter her dark cabinets white. The new white finish on her cabinets made it even more of a total makeover for Kathy’s kitchen. Now with granite tops, it truly was the look of a whole new kitchen! Kathy had the choice of our 10 promotional colors of stone and she ended up choosing “Coffee Brown” granite in a polished finish. This dark polished stone really gives a rich look to the space. The old laminate tops were removed for a template to be made by the stone fabricators. Some minor carpentry work was done to address a leveling issue with the age of the home and where the existing cabinets had settled. 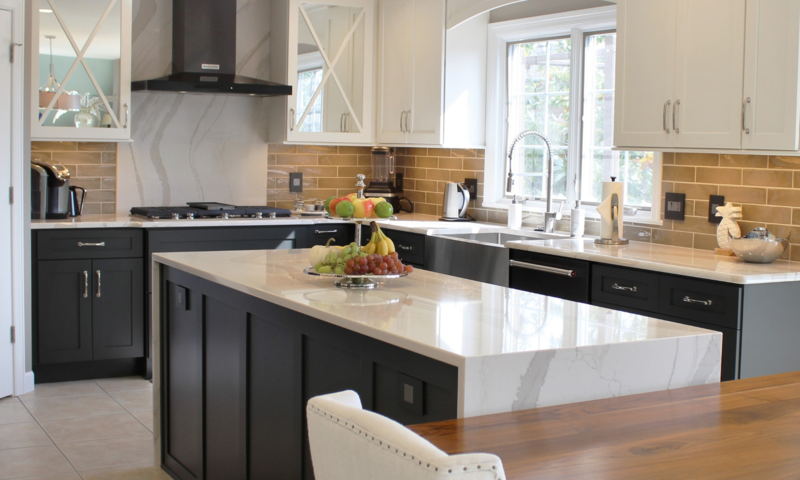 The weight of new stone tops must be distributed correctly for a safe and correct installation. Our expert stone fabricators measure a number of locations and lengths to confirm the new tops will be correct. We will soon have a full post on the blog about what you can expect during your template appointment. Kathy’s new sink area is our favorite part! She chose an E-Granite sink by Elkay that has a feature that we love, a lowered center-divider. This allows for a small fill when needed but plenty of space for large serving dishes or cookie sheets to be washed within the sink. We also came across a little tip from Kathy that we think is pretty genius. Take a look at the tray beneath her soap dispenser, it’s actually a soap dish. Kathy had heard about how a leaky dispenser can cause damage to natural stone and purchased a solution that gives her peace-of-mind that she won’t need to worry. When she found her new soap pump, she also bought the soap dish in the same style and finish. Et Voila! A matching tray! 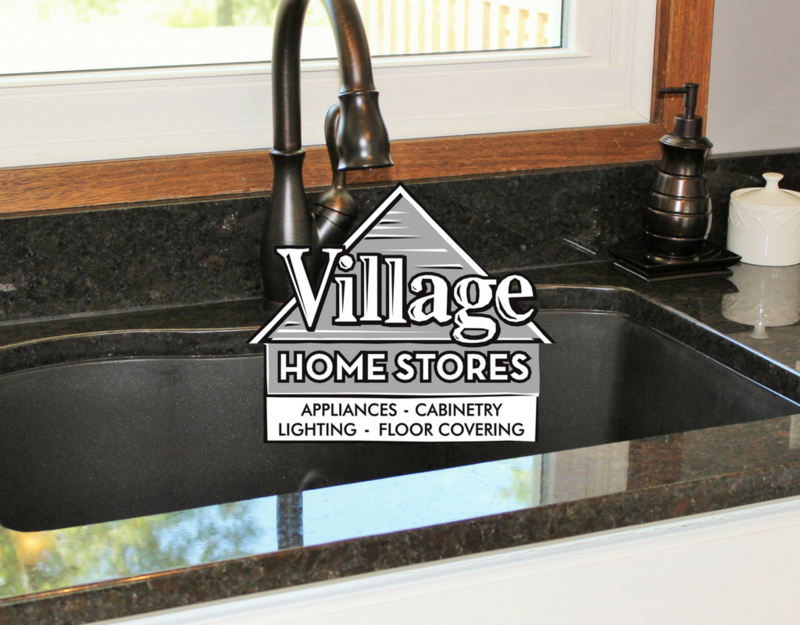 Call or contact us today for a free estimate on upgrading your countertops with Village Home Stores. While we don’t give away free granite everyday, we can offer you a fantastic price and expert work. (309) 944-1344.